In 2015-16 the NHS employed around 1.6 million people with a combined budget of £136.7 billion. As the NHS is funded by British tax payers it is a real political hot potato, and the debate about how much money goes into the NHS and how that money is spent rages on. The opposition parties are eager to persuade voters that the NHS would be safer in their hands, whilst the current conservative government is trying to reform the system and push forward controversial policies such as the 7 day NHS, and changes to junior doctor’s contracts. These changes were so upsetting to the doctor’s they went on strike, sparking concerns that patient care would be put at risk. The NHS is having to cope with a number of challenges; the benefits of modern medicine means we’re all living longer, and an ageing population means a higher yield, and higher costs. Better medical technology and medicines are also driving up costs. Add to this the pressures of years of government austerity policies, and the results are a health care system struggling to cope with demand. This has lead to overcrowded hospitals, with patients on trolleys in corridors due to a lack of beds, and long waiting lists for vital operations. In analysing the NHS conversation on social media, we noticed that the majority of influencers talking about the NHS could be split into 3 main categories. NHS staff, politicians and journalists. Below is a list of the top 20 influencers in each category. If you’re keen to learn more and discover the top 50 in each category, just hit the download button to get the full report. 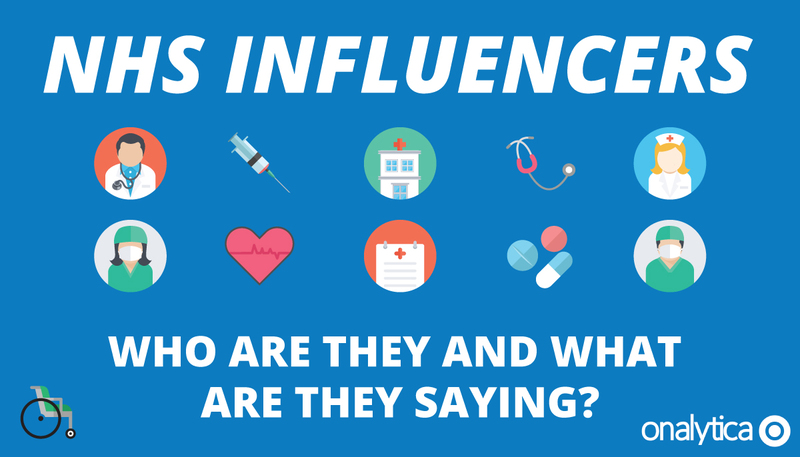 WHO ARE THE TOP NHS STAFF INFLUENCERS? 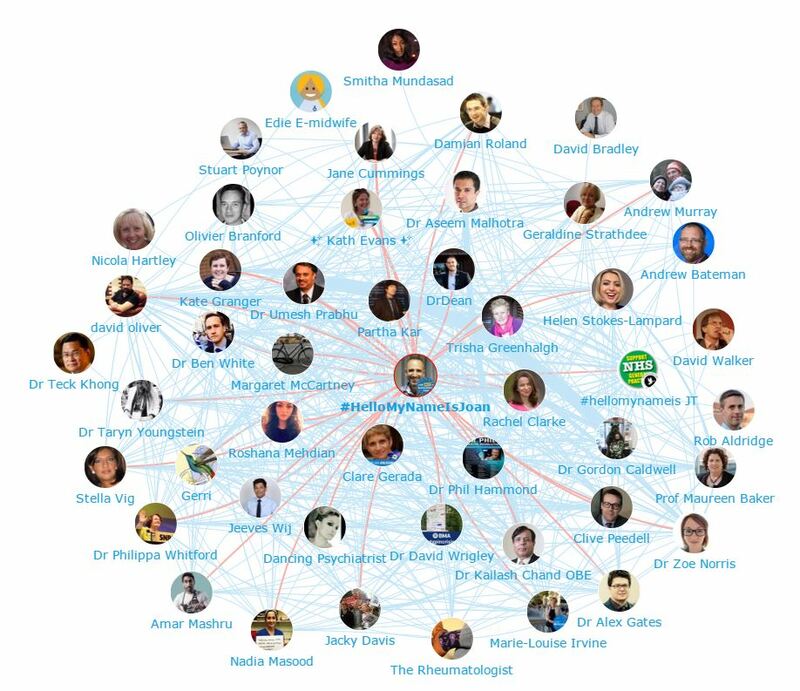 Here is a network map showing the online conversation between the top 50 NHS Staff influencers with the number 1 influencer @RoaringNurse at the centre. This map was created with our Influencer Relationship Management software (IRM). Be sure to click on the map to enjoy the full size network map in greater detail. Below is the list of the top 20 NHS Staff influencers, to get the full top 50 list be sure to download the full report! WHAT ARE THE NHS STAFF SAYING? 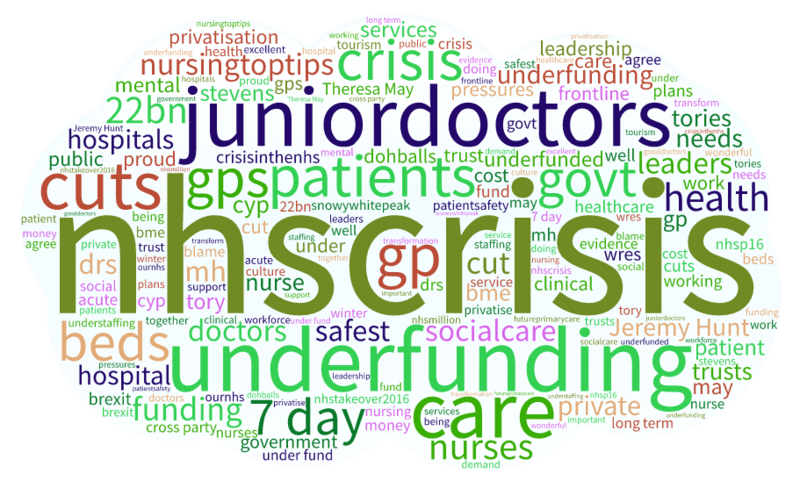 As you can see “nhscrisis” was the most popular word used in conversations by NHS staff. This really brings home the severity of the situation when you have your most influential members of staff talking about a crisis in the workplace. “Underfunding” was the 2nd most frequent topic followed by conversations around “Junior Doctors” which feature highly due to the controversial junior doctors contract enforced by the government. “Patients” and “care” were also popular topics showing that despite the crisis facing the NHS, patient care is still of the utmost priority to the staff. 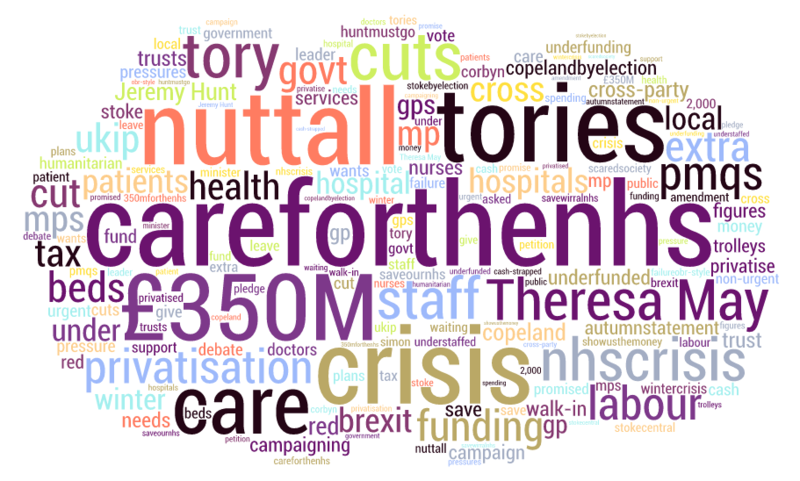 The theme of “cuts” appears a lot in conversations together with “funding”, “govt” and “beds” (no doubt a reference to the shortage of hospital beds). “7 Day” and “Jeremy Hunt” are also major themes among NHS staff. WHO ARE THE TOP POLITICAL INFLUENCERS? 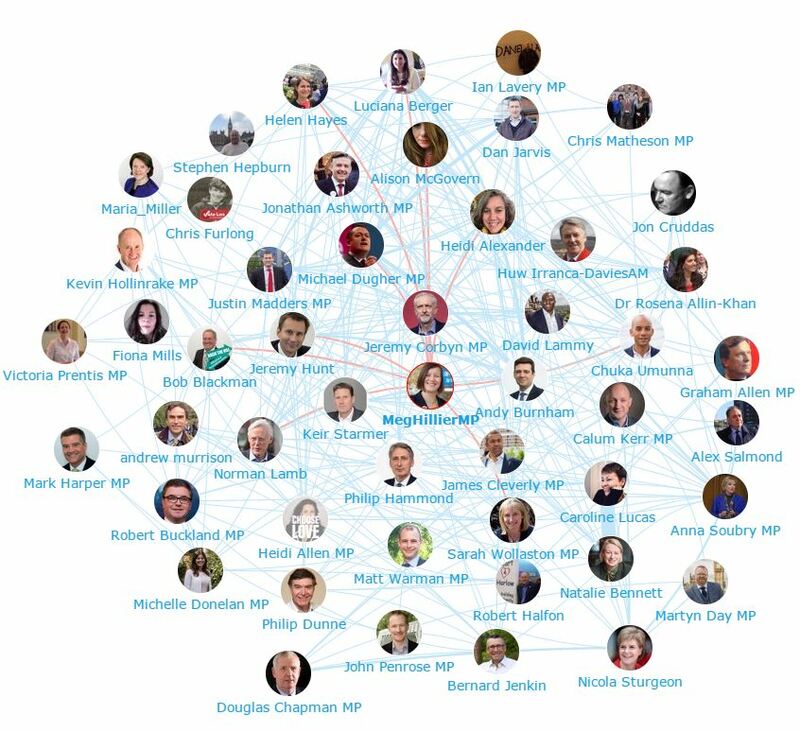 Here is a network map showing the online conversation between the top 50 political influencers, with the number 1 influencer @Meg_HillierMP at the centre. This map was created with our Influencer Relationship Management software (IRM). If you are interested in learning more about identifying, managing and engaging with influencers click here to get in touch! Below is the list of the top 20 Politicians talking about the NHS, be sure to hit download to get the full report. The most popular word mentioned in conjunction with the NHS among the politicians was #careforthenhs (the Labour parties campaign slogan). Also high up in the list of words was £350M, a reference to the vote leave’s claim that leaving the EU would mean £350m a week more for the NHS. References to UKIP leader Paul Nuttall were frequent due to his controversial view that NHS stifles competition and should be privatised. Mentions of the word “crisis” was high among politicians, as were mentions of “tories”,”cuts” and “Theresa May”. If you’re interested in looking at these influencers in more detail, as well as discovering more influencers, why not head over to our product page and get a free trial by clicking the button below! 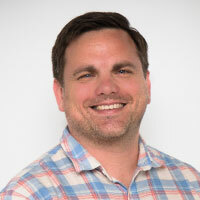 WHO ARE THE TOP JOURNALIST INFLUENCERS? 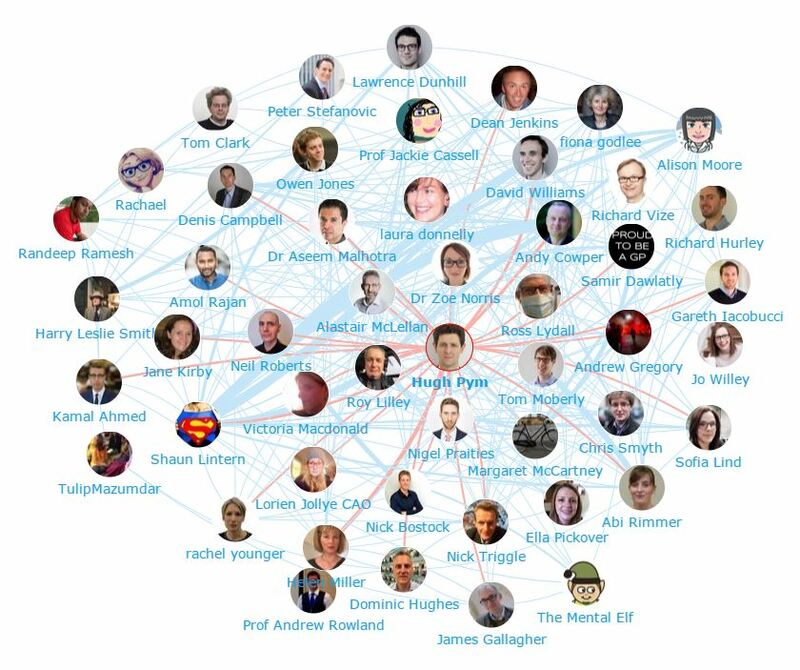 Here is a network map showing the online conversation between the top 50 journalist influencers mentioning the NHS with the number 1 influencer @BBCHughPym at the centre. This map was created with our Influencer Relationship Management software (IRM). You can click on the image to enjoy the full size network map in greater detail. Below is a list of the top 20 journalists talking about the NHS, be sure to hit download to get all the insights! WHAT ARE THE JOURNALISTS SAYING? Topics among the journalists were on average a lot more evenly spread. 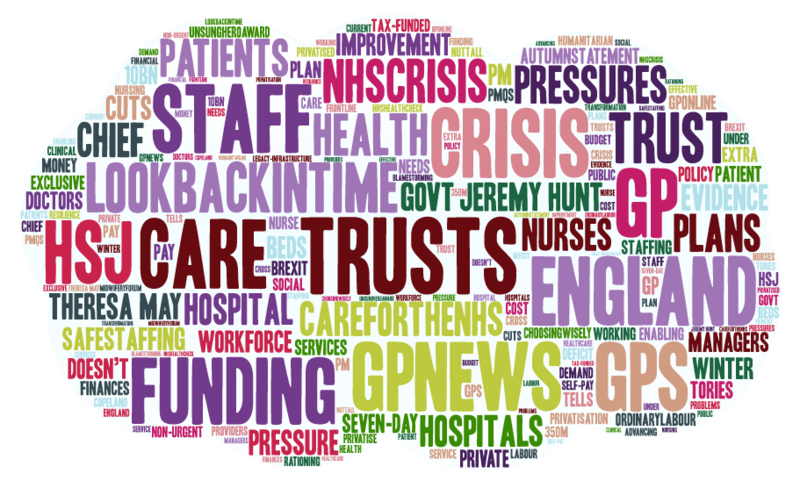 “Funding”, “Staff” and “Crisis” again ring true with most of the journalists, as do mentions of “Pressures” and “Jeremy Hunt”. 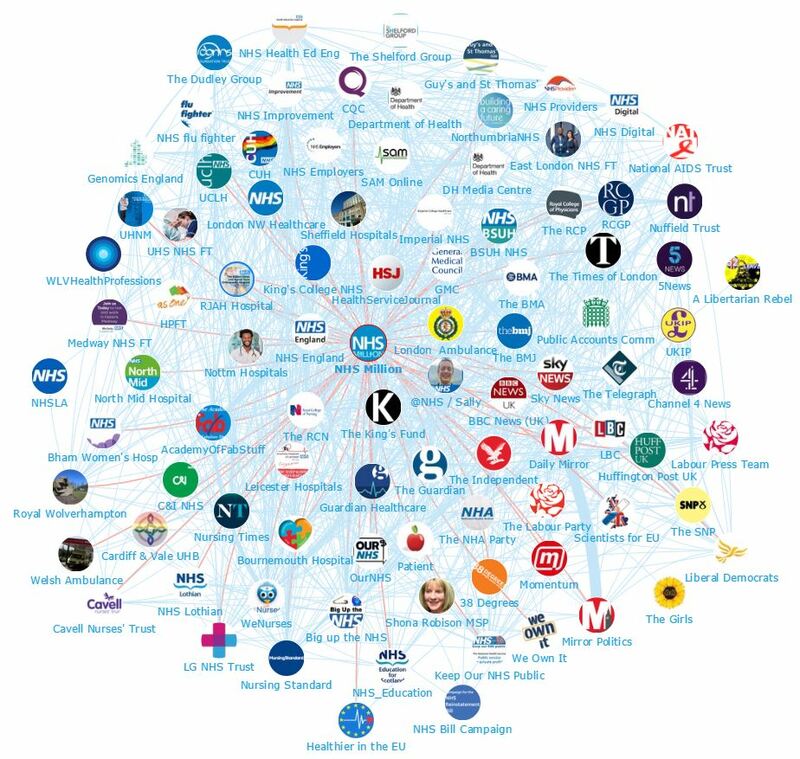 Below is a network map showing the online NHS conversation between the top 100 Brands with the number 1 influencer @NHSMillion at the centre. This map was created with our Influencer Relationship Management software (IRM). If you are interested in learning more about identifying, managing and engaging with influencers click here to get in touch! Below is the list of the top 50 brands talking about the NHS, be sure to hit download to get the full top 100 list! Disclaimer: As ever with these lists, it must be stressed that the ranking is by no means a definitive measurement of influence, as there is no such thing. The brands and individuals listed are undoubtedly influential when it comes to driving discussion around the NHS.